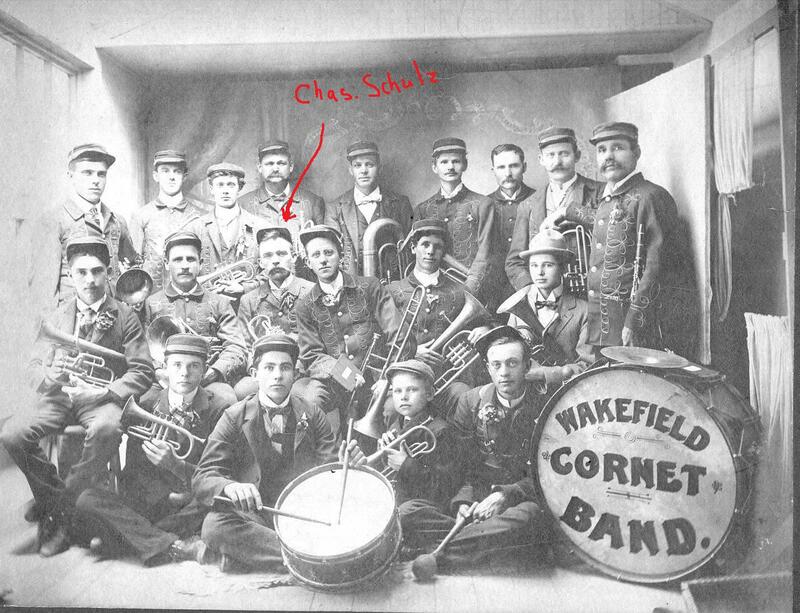 Lennie's Diary - 1898: The Wakefield Cornet Band And How It Became Art! That Lennie! His diary was a small notebook that would fit into his shir t pocket. It's not surprising that each day's entries were limited to a few words. The book also included postage stamp size photos glued several to a page. One of those photos was Lennie wearing a band uniform. I posted that photo yesterday but I'm including it again today because I want you to see that Lennie is wearing the uniform of the Wakefield Cornet Band. Surprisingly the quality of the thumbnail size photo was good enough that my scanner was able to copy Lennie's picture at a high resolution so that it could be enlarged. Who would think they could take such good photos in 1898! Old photos are sometimes like that. If you want to check for the amount of detail availa ble in an old black and white photo, simply look at it through a magnifying glass. You may be surprised that you see details with a glass that you don't see with your eye. If so, the photo can be scanned at high resolution for enlargements. This photo of the "Wakefield Cornet Band" is undated. And, no, Lennie is not in this particular photo! But his brother-in-law is. In fact this is the fellow Lennie mentions in today's entry. 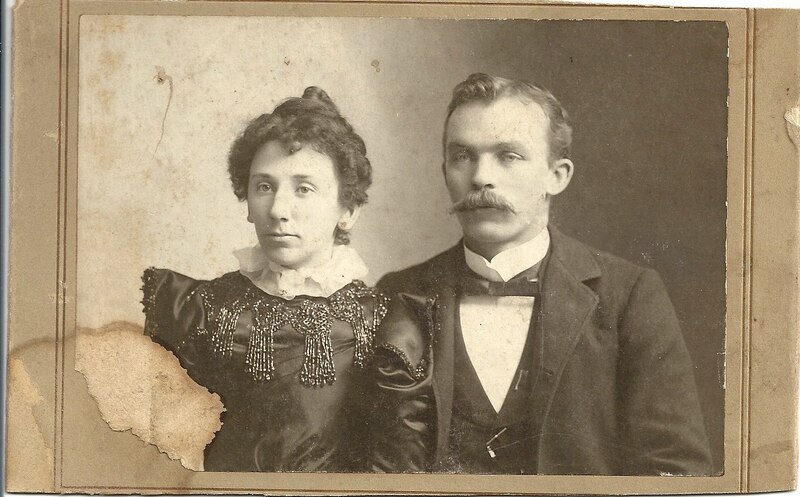 Charlie Schulz had married Lennie's sister, Flora Olive, in August 1895. I'm guessing this may be their wedding photo. 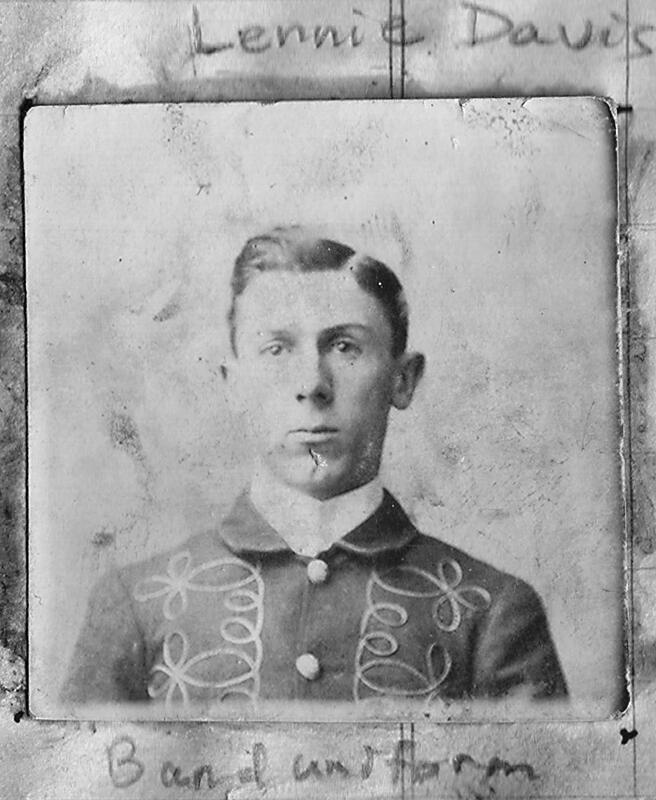 Charlie and his brother, Frank Schulz, were instrumental in Lennie meeting his future wife. But that's a long ways in the future yet. Perhaps we'll mention her later. Here's something interesting about this vintage photo of the Wakefield Cornet Band. Artist Charlotta Janssen used this vintage photograph as the basis for a painting in her series "Americana on Canvas". You can read about Janssen's version of the Wakefield Cornet Band here. Curious if there is still a Wakefield connection. I referred this blog to a friend who lives there today. Is the author of this blog related to Lennie? The author of this blog is married to Lennie's grandson. We live within an hour's drive of Wakefield and visit there several times a year. Came from Debby's place - what a CRACKER of an idea! In the late 1930's and early 40's the farmers would come to town on Wednesdays and Fridays to bring their milk and eggs and do business. So the town was busy those nights and everyone met downtown to visit, go to theatre and listen to the band. The town had a bandstand on mainstreet and the band would play every Wednesday night during the Summer. Grandpa Lennie would round all of us up in his pickup and we would go down and park on mainstreet where we would listen to band and grandpa would buy us a ice cream cone at the ice cream parlor. It was so much fun just being able to see all your friends and relatives. Man that ice cream was good and I will always remember the fun we had on those warm summer nights! This is great--We have a typed copy of a diary my husband's great great grandfather wrote during the civil war. Wow, Linda! That would make a great blog!!!! 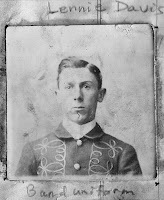 Old photos are almost always of higher resolution because they were taken on big negatives. Hey - do you think this might have been the inspiration for the artwork on the cover of St. Pepper's Lonely Hearts Club Band? It sure evokes that image in my mind. GK, I should have known that. I remember the photographer who took our school class photos. He used a curtained camera on a tripod. The negatives may have been on glass...he slid them in and out of the camera for each photo. That was in the 50s.